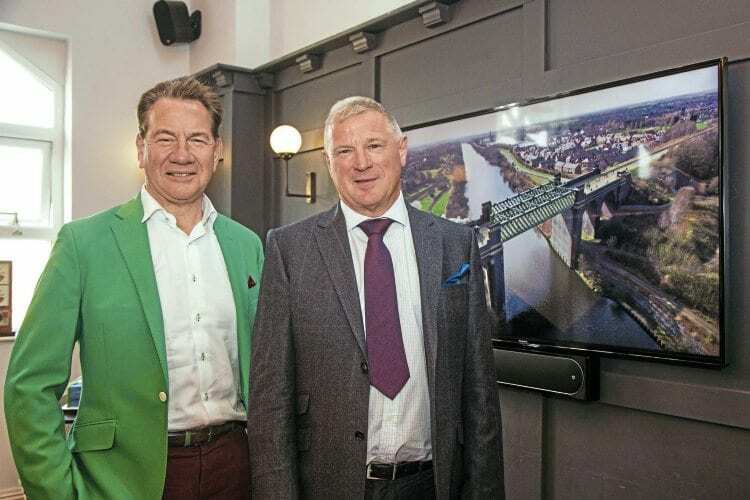 GREAT Railway Journeys presenter and former cabinet minister Michael Portillo has launched a £30 million project to set up a new heritage line over the Manchester Ship Canal. Businessman and philanthropist Neil McArthur wants to reopen six miles of disused track between Irlam in Salford and Timperley in Trafford, while adding 8½ miles to the National Cycle Network. The plans were unveiled by the pair at a press event at Irlam station on March 28, two years after the completion of the restoration of the station house in a scheme funded by Neil’s Hamilton Davies Trust. The trust gave £2 million for the derelict building to be turned into a cafe, heritage centre and community centre. In total, the charity has already contributed more than £7 million to community facilities and activities in Irlam and Cadishead. Neil’s plan for the railway is based on a report he has submitted to two local councils, Transport for Greater Manchester, Network Rail, and cycle network group Sustrans. It calls for political support from the statutory bodies to reconnect communities along the line which lost the passenger service in 1964. Freight ended in 1984 with the closure of Cadishead Viaduct over the Manchester Ship Canal. Previous Post:Builders start work bridging that gap!